Integrating applicant, employee, payroll and benefits data, the primeFORCE application makes it easy to execute recruitment, hiring, onboarding, benefits administration and more. Leveraging our primeFORCE partners and leaders in the insurance market, you can put together affordable, tier-one employee benefits, while optimizing your spend on enterprise-wide insurance. we provide 24/7 virtual access to over 35K primary and emergency care physicians and 13K psychiatric and behavioral health specialists, enabling you to improve quality of care right from your facility. Our integration capabilities enable the primeFORCE application to supplement existing workforce systems, while ensuring various stakeholders have permissions to execute functions like recruitment, onboarding, benefits admin, etc. Starting with the employee application, all data, documents and forms are organized into an easy-to-search database. Relevant data then integrates into other systems for onboarding, scheduling and more – eliminating duplicate entry. 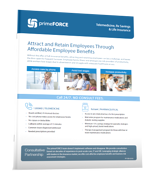 With anytime online access to data and workforce analytics, primeFORCE eliminates paper and manual processes, enabling users to shift more focus to recruiting and retaining the highest quality workforce. Multi-Year Strategy to Drive Down Claims Spend and Premiums. Build your multi-year insurance savings plan today.